Isn't it time stop worrying about your patio pots getting watered properly? 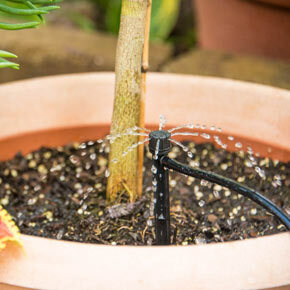 Cultivate happier, healthier plants with the consistent watering this easy to use kit provides. Our own design, The Dripster! makes it easy to care for your plants with adjustable nozzles that will water all your pots with a simple turn of a faucet. 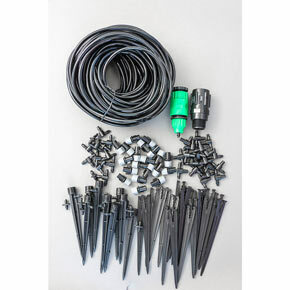 It's an affordable irrigation kit that you can arrange in endless combinations. 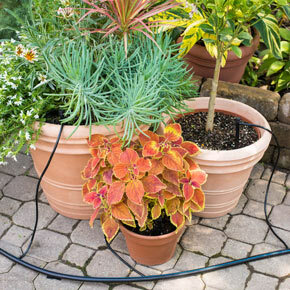 It's so easy to install; simply arrange your plants where you'd like them and cut the hoses (included) to the desired lengths. The tubing is easy to cut with scissors, to any size that fits your plantings. Extensively tested by our research team, we use this system in our own trials. 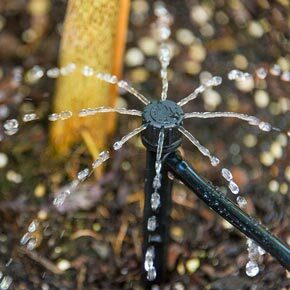 Adjustable spray nozzles accommodate each plant's different watering needs. Made of durable materials; this kit includes everything you need to turn watering chores into a twist of the wrist. Click here to download included instruction sheet.